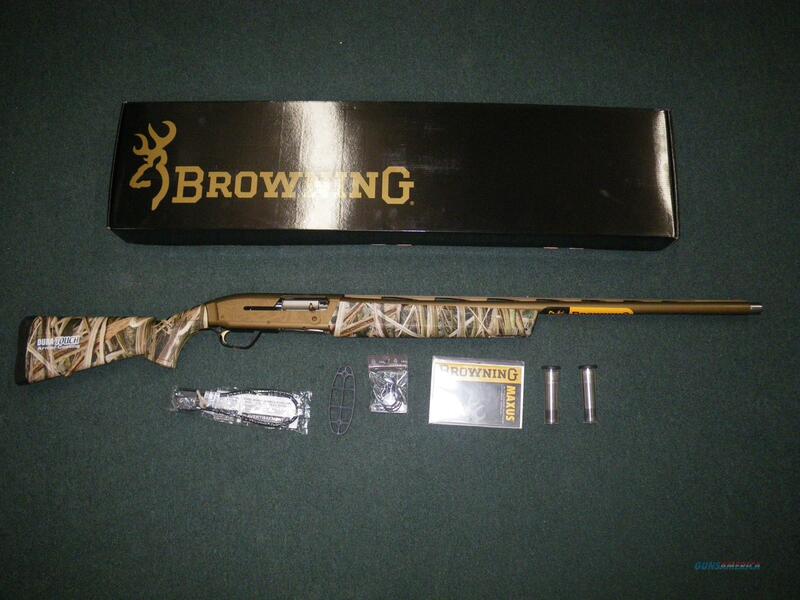 Description: You are bidding on a new Browning Maxus Wicked Wing in 12ga with a 28" barrel and 3.5" chamber. Now waterfowlers can choose between a pair of Browning autoloaders with custom touches to make them stand out — in a good way. Wicked Wing autoloaders feature a Cerakote Burnt Bronze camo finish on the receiver and Burnt Bronze on the barrel. The oversize bolt release makes it easier to manipulate with gloves. A fully chromed bore adds corrosion resistance and longevity for year after year of shooting performance. The PowerDrive Gas System is capable of cycling a wide range of loads and will take a good deal of the sting out of those 3 1/2" magnum goose loads. Likewise, the Lightning Trigger, with the fastest trigger lock time of any autoloader trigger in its class, will improve your chances of staying on target when you're trying to reach out to those high flying honkers. Displayed images are stock photos. Any questions please feel free to ask (our phone number is in the additional information tab above).